Estonia has unveiled plans to tackle obesity by reducing sugar consumption, starting with a tax on sugar-sweetened beverages that is set to come into force in 2018. The initiative is expected to raise 24 million euros in revenue each year, which is predicted to lead to lower intakes of free sugar and energy and in turn contribute to improvements in obesity and dental health. The catalyst for this innovative step is an evidence brief for policy (EBP), a compelling body of global and local evidence prepared by Estonian policy-makers, public health experts and academic researchers. The EBP was supported by WHO/Europe and produced under the umbrella of the Evidence-informed Policy Network (EVIPNet) with the title “Reducing the consumption of sugar-sweetened beverages and their negative impact in Estonia”. It asserts that the consumption of sugar-sweetened beverages is more associated with increased energy intake, weight gain, overweight and obesity than any other food or beverage, as well as with the development of several noncommunicable diseases and poor oral health. Already, more than half of all Estonians are overweight or obese, and the numbers are rising rapidly, especially among children and adolescents. The EBP focuses on children, as beverage preferences and consumption patterns develop early in childhood and can persist over time. A recent survey in the context of the WHO Childhood Obesity Surveillance Initiative for Estonia estimated 28% of school-aged children are already overweight or obese. 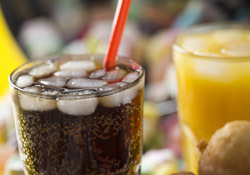 imposing taxes on sugar-sweetened beverages, subsidizing other food groups and/or substituting alternative beverages. It concludes that the 4 policy options complement each other and, if implemented in combination, would help to reach the goal of better health outcomes. Comprehensive, multicomponent interventions will reduce the consumption of sugar-sweetened beverages and their negative health effects. There are successful examples of similar taxes in France, Hungary, Latvia and Mexico. In Latvia, taxes were introduced in response to evidence presented in the Health Behaviour in School-aged Children report produced by WHO/Europe in March 2016. Many other countries are examining the body of evidence in support of such taxation and are considering following suit.